Manchester United are set to reward teenage striker, Marcus Rashford’s stunning start to the league season with a new contract when he clocks 20 later this month. The English international has been nothing short of impressive this season as he has helped Jose Mourinho’s men sit pretty at the top of the league table alongside Manchester City. Rashford has added a certain maturity to his game and is set for a significant upgrade on his current £50k a week deal at Old Trafford. The striker has largely played on the left this season due to the remarkable form of Belgian striker, Romelu Lukaku who has taken to life at The Theatre of Dreams like duck to water. The form of Anthony Martial also has ensured that he and Rashford alternate on the left, and that competition has driven the pair to exceptional form already this season. 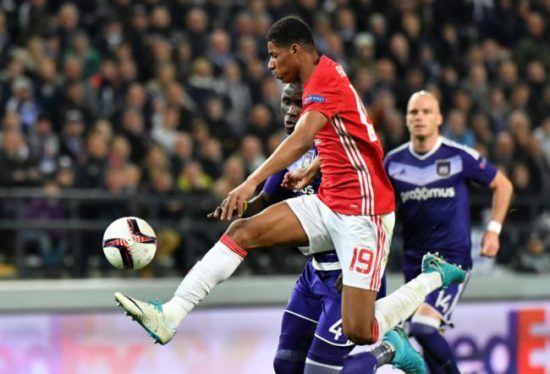 Rashford’s meteoric rise means that the new contract is inevitable to ward off interest from other clubs around Europe. Manager, Jose Mourinho didn’t sanction the deal earlier as his experience in football has taught him that giving young players huge sums of money weekly could affect their focus. However, his last contract had clauses it seems he has now reached, but the latest deal has not been announced. The exact figures of this new deal have not been reached, but it is believed that it will be fast-tracked in time till he clocks 20 later this month. The 19-year-old United academy graduate has been in stunning form for both club and country this season and played last week Thursday for England against Slovenia which saw a Harry Kane strike seal qualification to next year’s World Cup for the Three Lions. He is a classy player that can play as a striker and also as an attacking midfielder, who has added improved creativity, work rate and finishing to his game. He has 5 goals already this season.